Our steel grit is broken into sand by high carbon steel pellets and then tempered into three different hardnesses (ie GH, GL, GP). 1.GP steel grit is generally produced with sharp edges, but its edges and corners will be rounded quickly during use, which is suitable for the descaling of steel surface. 2. Although the hardness of GL steel grit is slightly higher than that of GP steel sand, the edge angle is also rounded very quickly, which is suitable for the pretreatment of descaling on the steel surface. 3. GH steel grit has the strongest hardness in these three models, and it maintains an angular shape during the blasting operation, which is especially effective for regular and hairy surfaces. 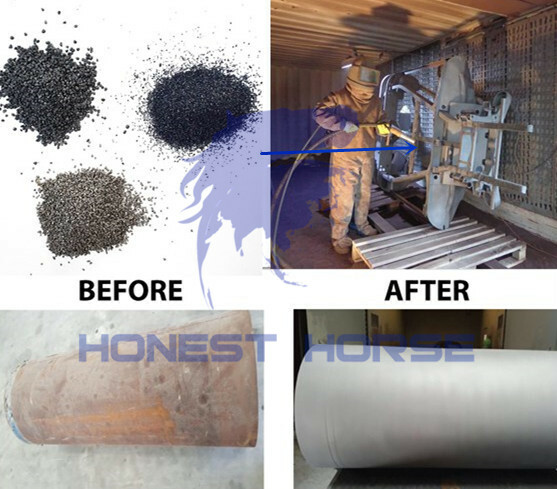 Mainly used in shot blasting equipment for compressed air. Steel grit as a metal abrasive, in casting, steel, automotive, container, machinery manufacturing, pipeline anti-corrosion, aviation, etc.